Wizard card | Clash Royale fan-site! Like all other rare cards in Clash Royale, Wizard has 11 levels. Each upgrade increases unit’s hitpoints and damage power. Wizard is an area damage troop (in other words, he is able to destroy a group targets) who can attack both ground-moving enemies and flying ones. These features make him a kind of universal troop, which is equally useful as well in attack and in defense. – Melee troops with moderate hitpoints and low speed of movement such as Valkyrie, Knight etc. – All type of swarm troops such as Minions, Minion Horde, Spear Goblins, Skeleton Army, Barbarian, etc. – All characters who are buildings orientated (Golem, Giant, Lava Hound, Balloon, etc.). The wiz is also very effective as a support troop for higher hitpoints card (tank-card) in attack, such as Giant, P.E.K.K.A, etc. Just deploy him after tank card and he will eliminate enemy troops on tank’s way to the tower. The wiz is almost useless if to use him alone against characters with huge hitpoints and damage power (P.E.K.K.A., Sparky, etc.). It’s necessary to give him a support with some other cards otherwise he will be eliminated quickly. – An ability to attack both air and ground targets. – Low hit speed (only one hit per 1.4 sec. ); According to this, choose place for him carefully. – Locks on targets. The wizard doesn’t change target before destroying previously chosen one. If your tower is under attack by troop that cause area damage, do not place wizard near the tower wall. In such position, he will receive damage also. The best way is to deploy him a little aside. The best way to eliminate wizard with low hitpoints cards is to wait the moment when he start to fire some target. In such moment, he is vulnerable because he doesn’t change targets until their destruction. Wizard is very effective in defense against legendary card Lava Hound. If your tank card is P.E.K.K.A, Giant, Sparky, etc. 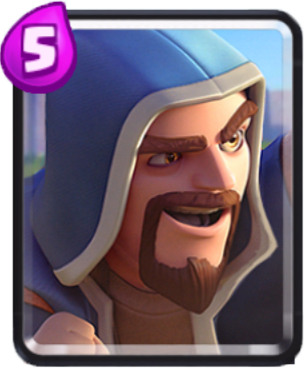 – add to them wizard into a deck, which can provide an excellent support in attack. Musketeer has the same hitpoints as wizard has, but in battle one on one, the musketeer wins due to higher rate of fire (of course only if the levels are equal). Among all sorcerers in Clash Royale (Wizard, Electro Wizard and Ice Wizard), the wiz has the biggest damage power.